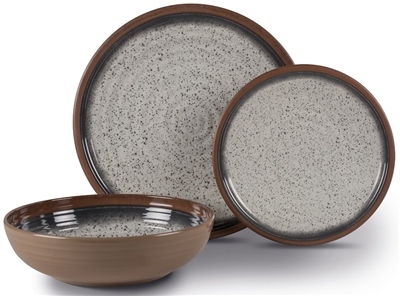 The Farmhouse set, from the Artisan collection of melamine tableware, combines traditional earthen colours with a speckled design. This 12-piece set, made of 100% melamine, is extremely durable, lightweight and dishwasher safe. The Artisan tableware features irregular contours to create a rustic aesthetic and enhance your alfresco dining experience. Lightweight , strong and practical theis set will be ideal for your outdoor dining needs.